Strength Generator is a new one from this past summer. 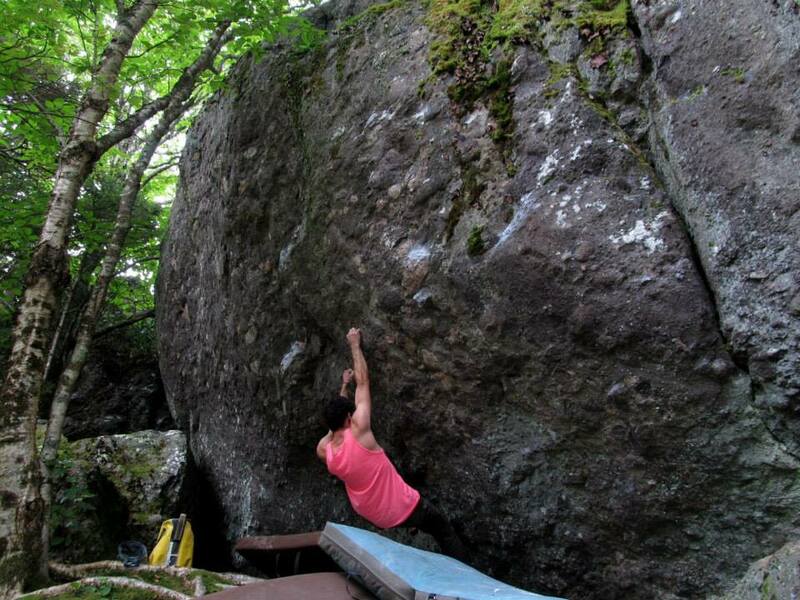 I put up a sit start to the classic highball “strength in numbers”(v5) which I called “Strength of One“(V8). 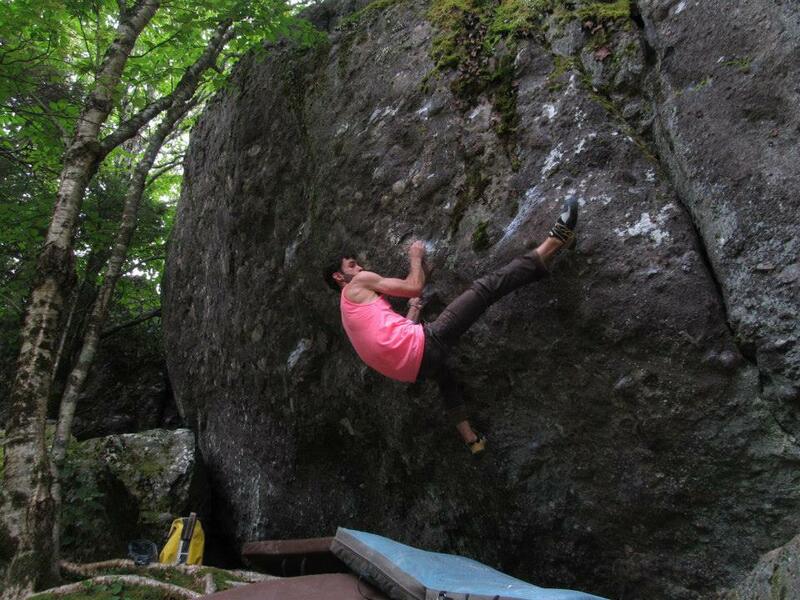 Further to the right is another classic line called “The Next Generator“(V4). Both the V5 and V4 are original GHSP lines done in the early 1990s by Jim Horton and a few other NC crushers. I thought that linking the tough new sit start moves of “strength of one” and trending right to gain the start of “generator” would be cool, and the holds were there. After exploring the moves I realized the line was going to be pretty tough for me, and ended up taking a couple of weeks to figure out and finish. Since it involved moves from “Strength of One” and “Next Generator” I named it “Strength Generator“(V10~). So far it has not -to my knowledge- seen a second ascent, owing to the fact that it was done after the release of the guidebook (look for it, and “strength of one” in the 2nd edition!). If you do it please let us know what you think! Strength Generator is on the Front Wall, a 2min walk from the LRT parking lot. The sit start is in a low undercling. 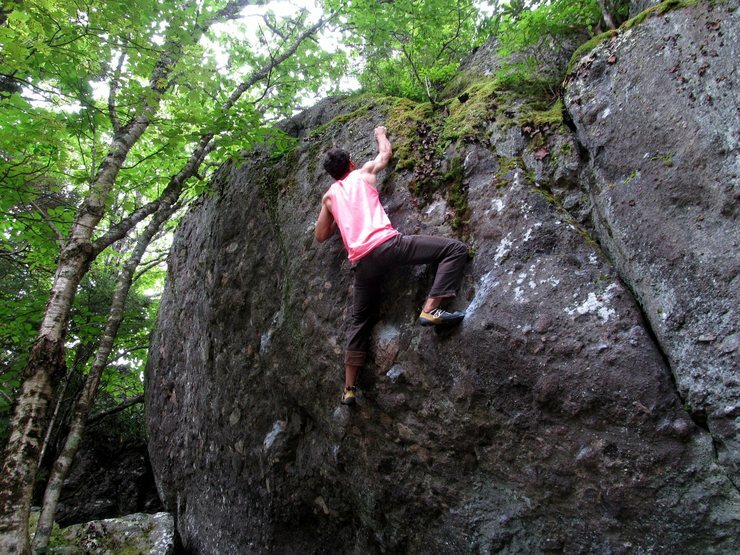 Make a tough move off of bad feet to the higher bad crimps. Make a big dynamic reach far and right out to a perplexing pocket/crimp/pinch hold (the hold is formed by a pink colored dropstone). Move into the crazy side-pull hold to the right, and then link into the juggy start for “next generator.” Finish out the highball-ish V4 through crimps and jugs up high. 15+ moves and a jumbled landing, so bring plenty of pads! I’m going to be leading a group of Boy Scouts on a summer trip that will include a couple of nights at the Grayson Highlands. 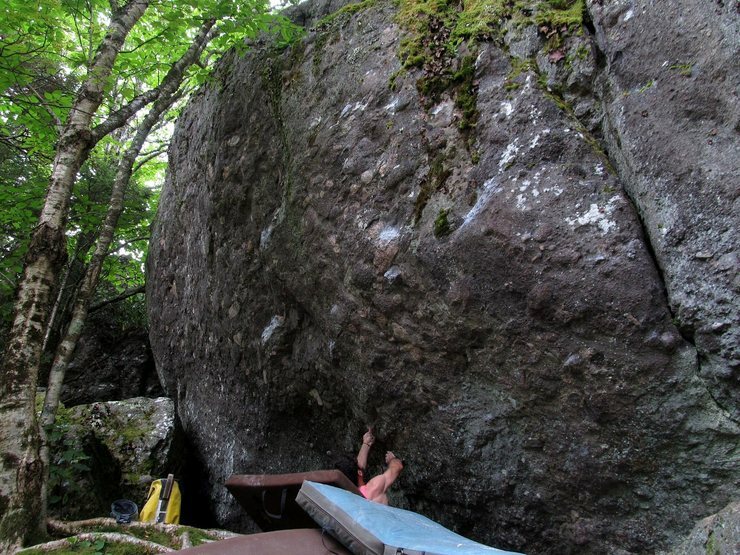 We don’t really know anything about bouldering and could use some instruction while there. Any ideas? There are two rental crashpads at the park office and rental chalk bags there as well. 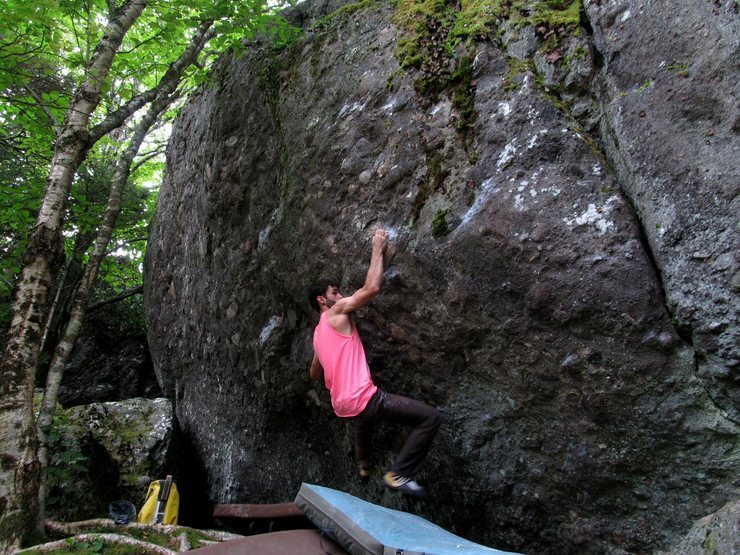 I would be happy to give you all any information you need, and there is a bouldering guidebook for Grayson Highlands as well, full of easy-going routes all the way up to some of the most difficult boulder climbs in VA. I teach a bouldering course there during the summer, but it is weather permitting and the days vary as to when it is available. Let me know if you all need any information! We are going to be there Mon July 20 and Tues July 21. I’ll have to get a copy of the guide book. If you’re going to be in the area those days maybe we could hire you out for a general lesson. I should be around during that timeframe so lets stay in touch. If the weather looks good I would be interested for sure!